Restistance Gallery, 265 Poyser St, Bethnall Green, London. Exhibition opening party Thursday 30th July from 7pm-11pm. Art, DJ's and bands Friday 31st 8pm-2am. Seminars, workshops, fashion show & masked ball Sat 1st from 2pm till Sunday morning. This is the first in a proposed annual festival & travelling show. The Resistance Gallery is also the home to Lucha Britannia the UK equivalent to Mexican "Lucha Libre" masked wrestling. Over the weekend there will be performances by masked bands, wrestling demonstrations, mask making workshops etc... all culminating in the spectacular masked ball on the saturday night. 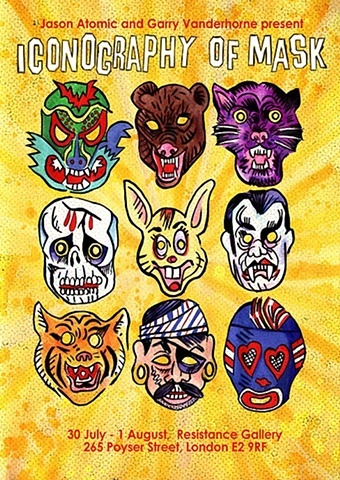 The exhibition features new mask related paintings by Jason Atomic and a group display of masks hand made and customised masks contributed by over 40 artists from around the world.